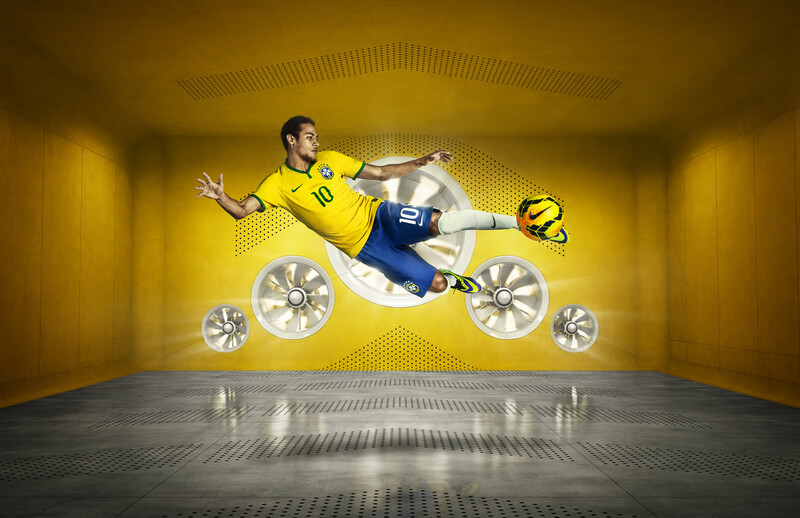 Nike has unveiled the new Brazil National Team home kit at an event in Rio de Janeiro on 24 November. The kit, which will be worn during the World Cup, combines performance innovation, cultural design cues and environmentally sustainable materials. Nike will be the kit supplier to 10 of the 32 tournament finalists. Adidas & Puma each have deals with eight teams. The kit, Nike explains, aids performance by regulating player body temperature and keeping players cool. The Dri-FIT technology pulls moisture away from the skin to the outside of the garment where it evaporates more quickly, and laser-cut holes and engineered mesh in key areas where heat is generated allow for increased breathability and airflow. In line with Nike’s commitment to superior performance with lower environmental impact, the shirt, shorts and – for the first time in a national team kit – the socks, all feature fabric made from recycled plastic bottles. Each kit is made using an average of 18 recycled plastic bottles. Since 2010, Nike has diverted almost 2 billion bottles from landfills, enough to cover over 2800 full-sized football pitches. Designers utilized three-dimensional body scans of the entire Brazilian National Team to create an updated fit, improving comfort and allowing the body to move naturally within the kit. The jersey features a new Y-neck design. The shorts are a classic Brazilian Varsity Royal with a white stripe. Simple and iconic, the fit is slimmer and more tailored to the body, with a cut specifically designed to aid movement and comfort. The Brazilian crest has been updated and made slightly larger, with a gold colored metallic weave added to the crest for a shimmering effect. Behind the crest, on the inside of the jersey, is the slogan “Nascido para jogar futebol” (“Born to Play Football”). Nike also worked with Brazilian designer Bruno Big to deliver a mark of pride at the inner back neck of each jersey – a small yellow canary motif representing “Canarinho”, the nickname given to the team when they wear the yellow home jersey. Even the name and numbers on each kit have also been carefully designed with a micro fine pinhole for moisture management and cooling. The style of the name and number is inspired by the classic fonts widely used on Brazilian hand printed street posters. All jerseys worn by players and sold in Brazil are made in Brazil. 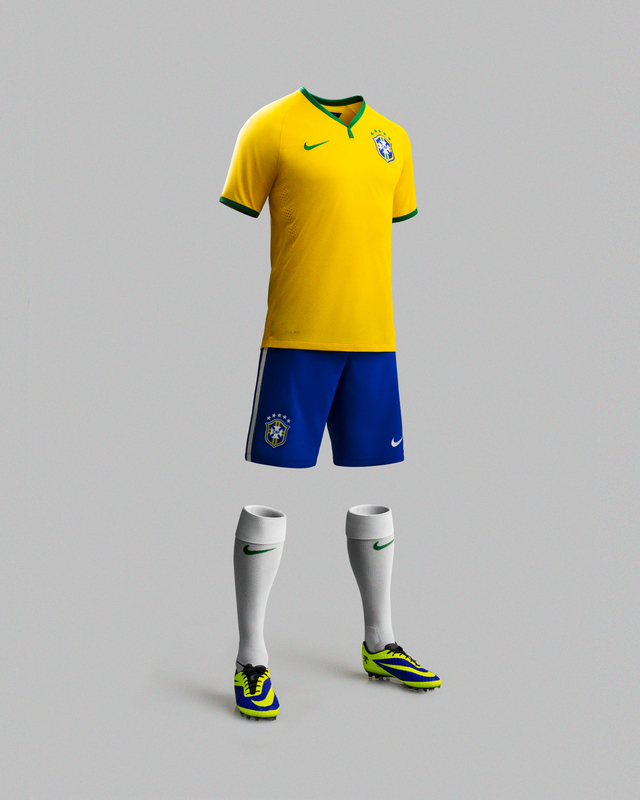 The Brazil kit is available in Nike stores from 5 December 2013.